One aside on fractional indices, from a friend. When teaching about expressions such as the one above he draws a picture of a flower. 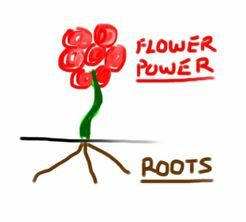 The roots go down below the ground (the line) and the 2 in the power is below the line so 2 represents the root. Then he spins a long tale about flower power and the hippy generation in the 1960’s, when he was learning this topic, where he links ‘power’ with the value above the line where the flower is. then grow the flower (power).